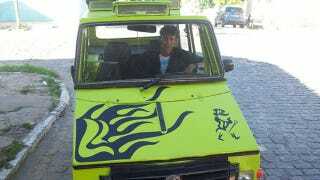 Homeless Brazilian carbuilder auctioning his "Shrimpmobile"
Two months ago we told you about Orismar de Souza, the Brazilian man who built his own car while homeless. Now he wants to sell his beast — but has already turned down an offer of about $15,000. Orismar says he's not driving the vehicle much because he lacks a license for vehicles. He says he wants to sell his "shrimpmobile" to buy a living space for his parents so they can retire. Doing so requires about $30,000. Couldn't he just send a bill for advertising to Johnny Walker?